During a flare-up a few weeks ago, I suffered severe muscle spasms and nerve pain that triggered a debilitating headache. As the hours ticked by with no relief and the pain increased, hopelessness closed in on me. Help me, Lord! Have mercy on me! I can’t take it anymore! I couldn’t think of the Bible verses that had lifted my heart so many times before. I couldn’t remember the attributes of God that had anchored my faith in the One who promises to never change, never leave me, and never let me down. Curled up in a wah-baby-melt-down, I could barely whimper prayers for mercy so I thanked God for the prayer warriors who, though struggling with their own trials, stood in the gap to pray for me when I had nothing left to give. Eventually, God relaxed my muscles and wrapped me in a deep sleep. But for the next few weeks I had limited energy. The Lord refreshed my spirit, as I rested in His presence, listened to worship music, and savored His Word in small bites. Today, I’m still struggling with fatigue and trusting the Lord with my daily battle with chronic pain. I’m reflecting on the overwhelming sense of despair that had smothered me, that feels as if it’s closing in on me during the harder days. How did I get in the deep, dark pit of hopelessness when I know God is and always will be faithful and trustworthy? These feelings can tempt me to slink into shame for being faithless, but the Lord reminds me that the valley moments He’s brought me through are behind me. The faith He has authored and is perfecting in my life is still intact. He promises to remain true to His character and true to His Word whenever I face trials. Was it a hard road? Of course. Did I feel like giving up? More than once. Did I truly believe I couldn’t take one more second of suffering? Absolutely! But even though I felt helpless, I was still praying . . . though some of those prayers were silent tears slipping down my cheeks. God is listening. God is with me. God is the same trustworthy and loving God He’s been and always will be. So why didn’t I feel like I knew those facts when I was focused on my circumstances and feeling overwhelmed by my suffering? Because faith has nothing to do with feelings. Faith doesn’t depend on the way I’m feeling when I’m suffering, the measure of my strength or weakness, or my ability to remember the right verses when I can’t even think straight. When we’re drowning in despair, the Lord patiently allows us to process without leaving our side, without changing His character, without losing control of the situation. As I continue to recover from the flare-up, I’m thanking God for being constant and true, loving and faithful and abounding in grace . . . especially when I can’t feel Him, when I can’t see His hand, or recall His words, or even attempt to say I believe. We’ll all have times when we feel as if our faith is faltering. Like the writer of Psalm 77, most of us have “cried out to God for help” (v. 1). “When I was in distress, I sought the Lord; at night I stretched out untiring hands and my soul refused to be comforted” (v. 2). As the psalmist struggled through weariness, doubt, discouragement, and hopelessness, he rested in the unchangeable, secure foundation of faith‒God . . . simply God. When he questioned the Lord (vv. 7-9), he opened his heart and reached toward God’s consistency (v. 10). 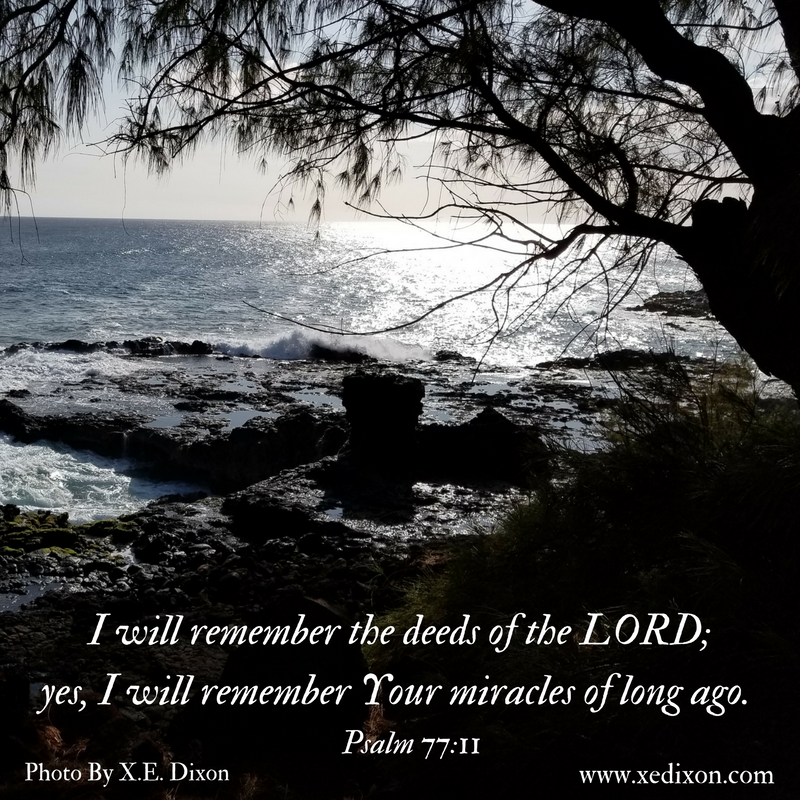 “I will remember the deeds of the LORD; yes, I will remember Your miracles of long ago. I will meditate on all Your works and consider all Your mighty deeds” (vv. 11-12). The psalmist turns to praising what he knows to be true, the surety of who God is and what He’s done (vv. 13-15). He affirms God’s majesty as Creator and Sustainer of the Universe (vv. 16-19). He remembers that the strong people of faith never relied on their own strength (v. 20). The psalter is filled with examples of God’s people coming before Him with raw emotions, struggling with suffering, doubting and dipping into despair. As we read through these verses, we can see where the writer switches from being self-focused to being focused on God and how He’s worked in and through the lives of others who’ve come before him. But we can’t tell how long this process takes. We don’t have to beat ourselves up or be ashamed of our times of weakness. We don’t have to hide our hurts or shy away from our moments of hopelessness. During those inevitable difficult times, instead of sinking into isolation, we can reach out to others and ask for prayer. We can pray for others, remembering all God has done and reminding ourselves that the truths we’re proclaiming apply to us, too. And we can experience the Lord’s power intimately, to feel His grace carrying us through because we cannot possibly imagine taking one more step on our own. Every breath is a testimony of God’s sustaining grace. Every tear is a prayer caught in His loving hand. Every sob is a song of proclamation that affirms God hears, God cares, God is with us. Every time a prayer warrior intercedes on our behalf, every time we pray on behalf of others, God proves He remains the same yesterday and today and forever. When hopelessness overwhelms us, we can inhale a sense of peace. We can trust God to anchor us to the unfailing hope of knowing Him and knowing He will stay true to His Word and His character no matter how we feel or how long these valley moments may seem. Lord, thanks for affirming that we’re never too far for You to cradle us in Your everlasting hope. Please give us all we need to trust You one step at a time. In Jesus’s name, Amen.